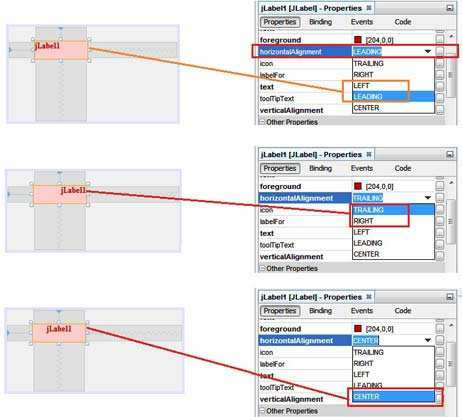 Normally, if you design any application and want to provide facilities to automatic resize controls according to application screen, then in java NetBeans, you can easily set some settings on controls, that will ease to use for further process. And in this post we will also describe the process to change the name of any controls according to desire. 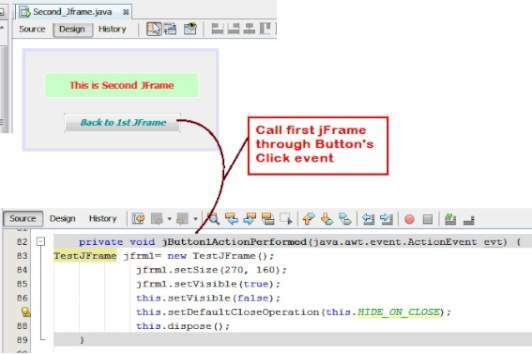 So, here SKOTechLearn will learn how to auto resize controls and change name of controls in java NetBeans. First, we learn Auto resizing process of Controls. Drag some controls from “Palette” window, whatever you want to add and select all controls or select one and right click on it. It will show you many option. You can select both or any one option. The following image show the complete process. When you apply these steps and when you run application, the controls will automatic adjust with the calculation of jFrame height width and control’s height width. 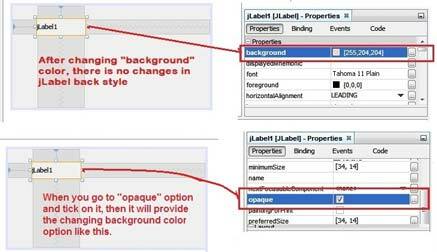 If you are using Netbeans for application development, you can change name through two way. First is through Static way with right click “Change Variable Name…” setting. Second is through coding in dynamic way at run time. 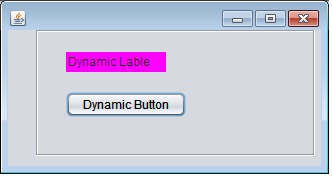 In this way just select any control and right click on it and find option “Change Variable Name…”. Click on that option, it will show you small screen with “Rename” name. In this screen, you will find the name of control. Change it whatever you want to input. This way, we can change the name. In this way we can create controls dynamically at run time, you can write code for it in “WindowsOpened” event or initialize component in class. But first you have to import some Libraries for component. Suppose, if you want to add some buttons and Labels, then import following libraries class. After that when you run application, it will looks like bellow. 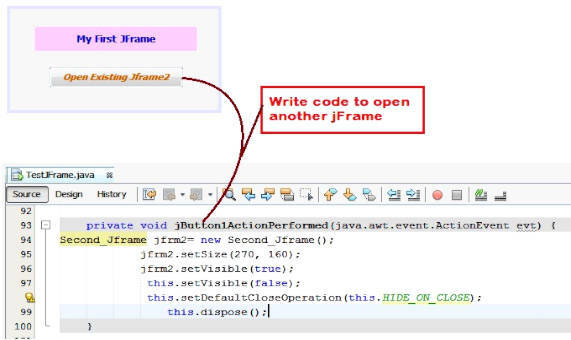 So friends, apply these steps and create whatever you want in java Netbeans. Now SKOTechLearn has explain how to Auto resize control and change name of controls in java NetBeans. Whatever point we run an application with Loop process in VB6.0 or vb.net, at that point we need to demonstrate the running circle process inside that application. At that point we use Progressbar. Fundamentally This is that control in which we portray the Loop procedure. So, here SKOTechlearn will describe the easy way to change Progressbar style with use in vb6.0 and vb.net. After that choose this control and drag it to Form. Now come to Properties window and select some properties to change predefined style of this control. There is another property, where you can change orientation. 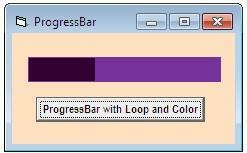 How to change ProgressBar color in vb6.0? 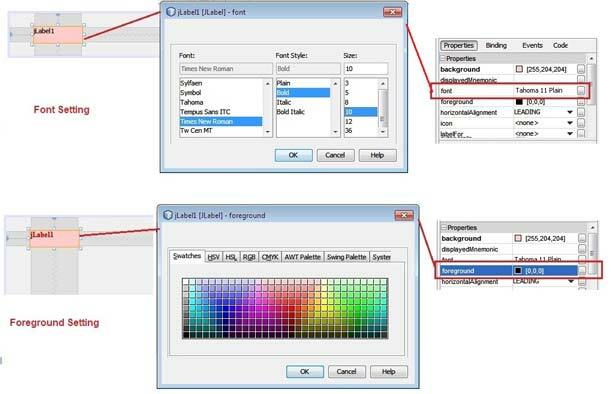 Now come to some interesting features of it for changing the color. So, first you have to know that there is no properties setting for this process, you have to write code just as mention bellow. 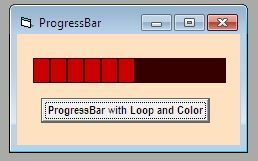 How to define ProgressBar in Loop? You can see that above given code process, there is also a loop in which this control is characterize inside it. Every time you have to increment value of MyPrgBar1 inside "While Loop". When you run Form and press “StrtPrbr_Btn”, it will show you as following image. Like blinking look, you have to just modify and add some coding inside loop. You will find a different type of attractive process just mention bellow. 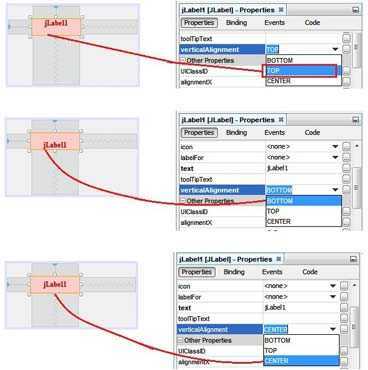 In vb.net, you can see the advance feature to graphically introduce controls with different style. So, First we understand about Properties. Like VB, you setting on “Scrolling” for style, here we will setting on “Style” like bellow. How to change bar color in Progressbar? Note : Loop value can not be greater than Maximum Value. How to show percentage in ProgressBar? If you want to show percentage like professional look, just write code inside a custom class. Dim percent As String = CType((MyPrgBr1.Value / MyPrgBr1.Maximum * 100), Integer).ToString & "%"
After that call this class in “PercentInBar()” button's "Click"event inside loop same as mention bellow. In this way the running application will looks like bellow. So, there is the easiest way to change ProgressBar style with use in VB6.0 and VB.Net with SKOTechLearn Tips. 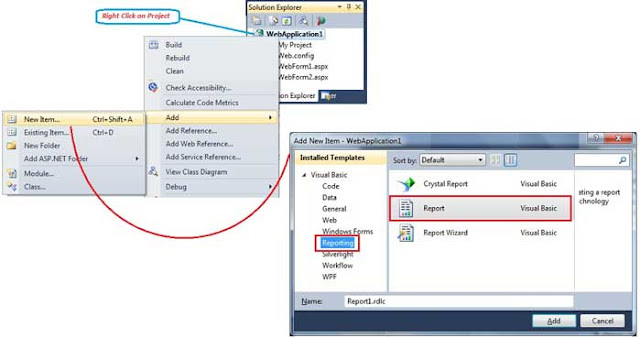 In ASP project, if you want to view report, then you have to use ReportViewer or Crystal Report. In this post, SKOTechLearn will explain the steps to add create or Design a ReportViewer (RDLC) in ASP Dot Net. Reading to this tutorial, there is short UI process to understand about report in ASP. Here we will understand Report process in Two ways. First you can Add report on Existing Page. Second, Add report on other Webpage. First you can Add report on Existing Form. Second, Add report on other Web Form. Now, we start step by step procedure for understand. First add a web Form in Project then add Report in your application like following steps. Next to reach “New Item…” and click on it. In this screen, left side Pane contain "Installed Templates”. Find “Reporting” Option and select on it. Then Click on “Add” button. The process is described in bellow given figure. When you complete the process of adding report on project. “Report1.rdlc” will be add on project. It will seen inside Solution Explorer screen. This is the way to add RDLC. There are another process and some more steps to view the report. Note: “Report1.rdlc” need the platform where it display the designed template. So, you have to use “ReportViewer” control. Move cursor on “Toolbox” screen to the left side of project. Find “Reporting” header and click on it. It will show two options (“Pointer” and “ReportViewer”) control options. Select “ReportViewer” option and drag on the Form’s Location. Increase or Decrease this control size according to need. After that, click on “Tasks” option to this control as describe in above image. 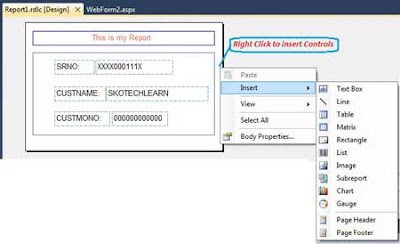 It will show ‘Choose Report’ combo, select report RDLC which you have create in previous step. Now this control will call that particular RDLC. Now, let’s design RDLC. For designing process when you right click there will be an option present, with name "Insert". 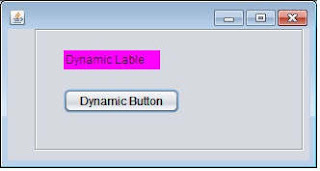 Insert some control in RDLC like TextBox, Rectangle etc. And design it according to requirement. After this process run your application. But, when you debug application, there is error appearing on webbrowser. Lets read error. It says about missing UI.ScriptManager. So, we have to add “ScriptManager” in webform. Where to find and How to add ScriptManager in ASP Form? There is way to solve above question. Find “AJAX Extensions” header from “Toolbox” screen. 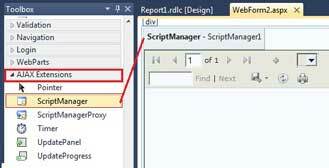 In this header find “ScriptManager”. Drag and drop “ScriptManager” on Form. After inserting this web control, it will reduce the error, which appear during runtime. Now run webform. You will find that there is no error and the output will looks like bellow. 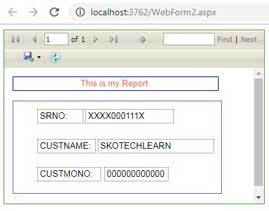 So, this post final conclusion is that you have to remember about add “RDLC”, “ReportViewer” web control, “ScriptManager” web control and Inset controls into RDLC for creating or designing of Report in ASP dot Net by SKOTechLearn Tips.